Okay, it is boozy (sugar), but this is a ‘treat’ dish. You will probably think there’s a lot of gelatine in the jelly, but alcohol inhibits its setting properties so you need more. The Angostura bitters isn’t absolutely necessary but it makes the jelly a lovely pale pink colour and foxes diners… they can never guess the secret ingredient. Put the tonic water, gin, lemon zest and juice and sugar in a saucepan with 150ml (5fl oz) of water and bring to just below the boil, stirring occasionally to help the sugar dissolve. Reduce the heat to very low and simmer for about five minutes. Put the gelatine into a dish and cover with cold water. Leave to soak for about three minutes; it will soften but won’t disintegrate. Strain the boozy mixture into a clear jug and add the Angostura bitters; you should end up with a nice pale pink colour. Taste; you should get a little of the Angostura but it shouldn’t overwhelm. 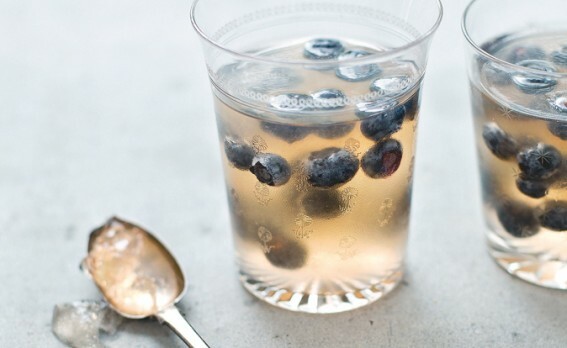 Divide one-third of the liquid between eight glasses and add one-third of the blueberries. Leave to cool. Refrigerate the jellies to allow them to set and reserve the rest of the jelly mixture. Once the jellies have a firm-ish surface, divide another one-third of the blueberries between the glasses and gently reheat half the remaining jelly mixture if necessary to render it liquid once more (you should always be able to put your finger into it; if the liquid gets too hot it will destroy the gelatine’s setting qualities). Leave to cool a little and top up the glasses evenly with this. Put in the fridge to set. Repeat, to use up the remaining berries and jelly, then leave for six hours to set firm before serving, just to be on the safe side.